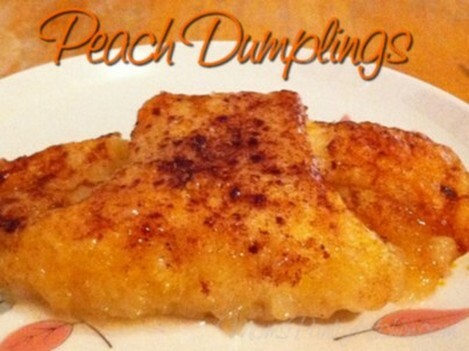 *You may use fresh or frozen peach slices for this recipe. Since its the off season, I used frozen and it turned out wonderfully! This could also be done with apple slices. Roll peach slices in a crescent roll tucking the bottom flap underneath. Place in a butter round glass pie plate. Melt butter in a saucepan, and add sugar, stirring slightly. Add vanilla, stir until mixed in, and pour the sugar mixture over peach dumplings. Pour 1/2 of the can of soda around the outer edges of the pan. Sprinkle the dumplings with cinnamon. 350 degrees for 40 minutes.